With long stints sitting behind a desk or behind the wheel, it’s no wonder back pain has become a regular feature of today’s hectic lifestyle. But just incorporating a few yoga moves or making time for a few stretches in your day can go along way to loosening up your back and your life. Dru Yoga is a heart-based yoga that has been specifically designed for current times, while still being rooted in the ancient yogic traditions. Its purpose is to strengthen the energy that surrounds the heart. 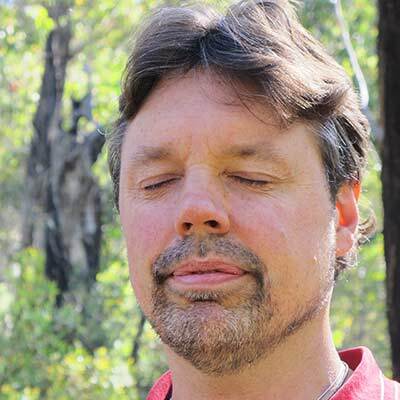 It does this by using flowing movements, gentle postures, breathing practices, relaxation and meditation. This is a truly holistic therapy that maintains optimum health and complements other natural therapies. 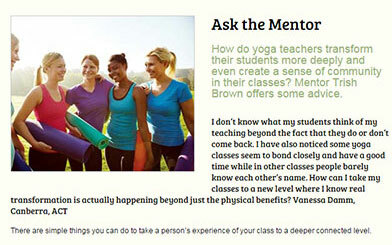 How do yoga teachers transform their students more deeply and even create a sense of community in their classes? Mentor Trish Brown offers some advice. "In my experience most students don’t come to your classes just to be instructed in yoga. As much as they come for the physical health benefits, they also come to be nurtured and cared for, to learn how to live without stress, and to meet with like-minded people. To really get to know your students I’d recommend allowing a good block of time before and after class - invite them to let you know how they are, and to give you feedback." If this reading material has inspired you, why not take the next step and try Dru Yoga and Meditation for yourself? Here are some free videos for you to watch and practice along with. "Meditation blends perfectly with one of the greatest yogic scriptures of all time – the Bhagavad Gita. The Gita is a success manual for life and its’ teachings are appropriate for you regardless of what religion you follow." "Meditation in general helps you to develop acceptance and emotional objectivity so that you respond to life rather than react to it. But Japa meditation, which uses the repetition of a chosen thought, breaks unhelpful patterns of the mind and therefore it releases us from habitual actions. It helps to remove the straightjacket of our outmoded habits." Our friends in Bosnia were able to cross generations of ethnic conflict and unimaginable personal traumas by finding an inner strength and self-esteem in their own hearts and in the hearts of their ‘enemies’, through the power of meditation. "Few in the West are aware that yoga was originally designed to enable people to meditate. 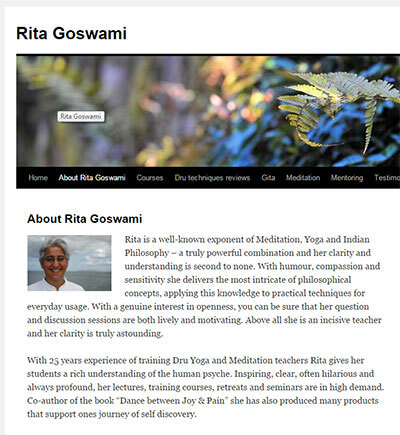 It’s incredible how conscious movement can remove the ‘fizz’ from your mind-body energy system, leaving the mind much smoother and more easily able to focus and concentrate.​"
The Bhagavad Gita, also known as the song celestial, is probably the best known and most loved of all of the great Indian philosophical works. It is part of a group of ancient Vedic writings known as the Upanishads in which a seer or luminary teaches a student by means of a discussion or discourse. 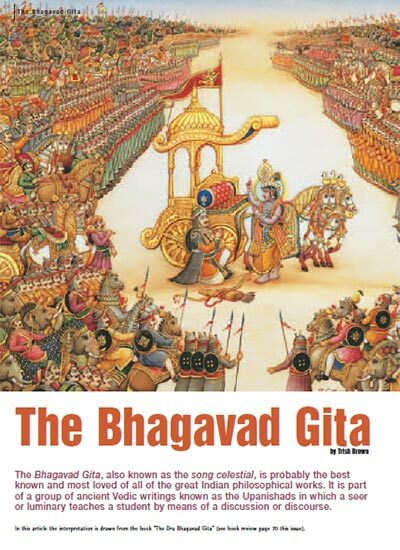 In the previous article on the Bhagavad Gita, the stage was set for the great story to unfold. 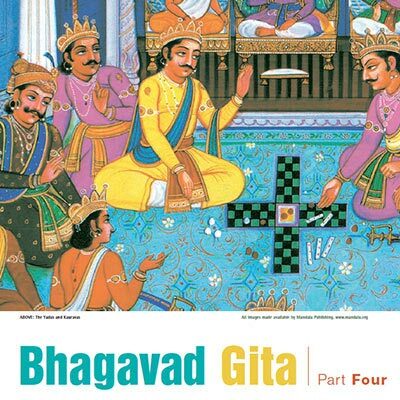 We arrive at the point of diving into the ocean of wisdom of the Gita, which is part of the magnificent epic poem, the Mahabharata whose characters portray every aspect of life in a rich tapestry of intrigue and mystery. To live well, what do we want to do or what should we do? It may seem strange that the setting for one of the world's most sacred texts, the Bhagavad Gita, is a battlefield. It is, of course, a direct parallel with the eternal struggle within us between the forces of good and evil and the battlefield of life. The Gita is a model that teaches us how we can be fully effective in the world as spiritual beings on this human journey. It teaches us how to live life here on earth in the highest way possible. With asana practice occupying most attention in a typical yoga class, it's easy to forget that yoga offers not just a path to physical health but also a framework for allround life management. 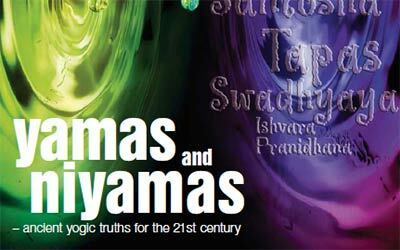 Yoga's ethical guidelines - the yamas and niyamas - suggest the values and behaviours likely to lead to a fulfilled, contented and productive life. Take your yoga a little deeper and explore how you can integrate these values into your everyday life. Yoga is one of the traditions that have made in-depth discoveries about the science of light. Yoga is based on the awareness that we live in a universe that is alive, conscious and reachable. The word “yoga” means “union” and this includes unifying individual consciousness with the living, caring consciousness of a universe of light. Human beings cannot live without light, yet the relationship between the two is more than an issue of survival. 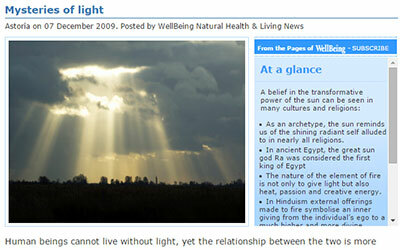 Since the dawn of humanity light has been drawing us into its powerful presence. We are irresistibly attracted to light. It captivates through its glorious splendour whether as sunlight, moonlight, lightning, starlight or fire. Mahatma Gandhi was willing to go to jail to bring about freedom for both South Africa and India early last century. 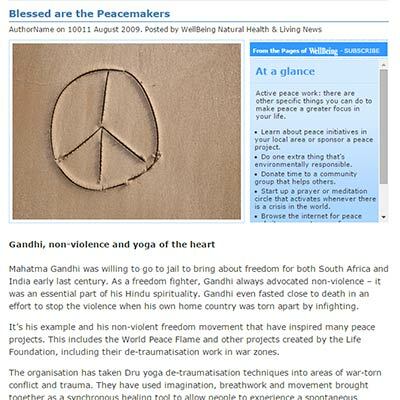 As a freedom fighter, Gandhi always advocated non-violence – it was an essential part of his Hindu spirituality. Gandhi even fasted close to death in an effort to stop the violence when his own home country was torn apart by infighting. It’s his example and his non-violent freedom movement that have inspired many peace projects. This includes the World Peace Flame and other projects created by Dru International, including their de-traumatisation work in war zones.